When it comes to Geechee Girl Rice Café—a low key Mt. Airy favorite on Germantown Avenue—a lot of people can’t get past the name. “What’s a Geechee?” is a question executive chef/owner Valerie Erwin hears often. Geechee refers to the people of African descent who inhabit the Sea Islands and coastal areas of the Carolinas, Georgia and Northern Florida. The Geechee people (also referred to as Gullah) are often credited with introducing rice cultivation to the Southeastern United States. To this day, they produce some of the most exquisite rice in the world. At Geechee Girl, patrons can sample menu items inspired by traditional Southern cuisine, augmented with influences from Chef Erwin’s eclectic training, acquired over 20 years of cooking at a broad range of Philadelphia restaurants. Think black-eyed pea fritters served with a piquant Asian dipping sauce or succulent barbecue chicken accompanied by savory rice gratin with goat cheese and cheddar. 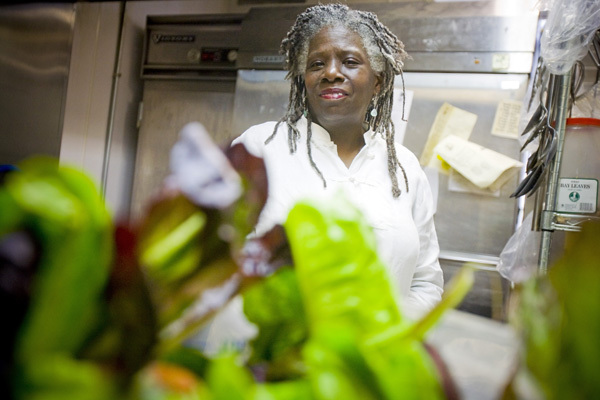 But it’s not just the mouth-watering selection of sophisticated soul food that shines at Geechee Girl—their commitment to using local, seasonal and organic ingredients makes them a true gem in Philadelphia’s restaurant scene. “You know how some people page through Vogue magazine and drool over the pretty dresses?” asks Chef Erwin, seated in the restaurant’s sparse, sunlight-filled dining room. “That’s how I feel when I see beautiful produce.” Erwin works hard to keep in close contact with her muse. Last year, with the help of a few restaurant patrons and friends, she converted the trash-filled lot behind the restaurant into a flourishing vegetable, herb and flower garden. Erwin is also a member of a local farm co-op, so she receives organic produce, dairy, flour and maple syrup directly from the farm. Using local products and seasonal produce that come from only a few miles away instead of across the country makes a marked difference when it comes to the flavor and quality of the food at Geechee Girl. “Produce is one of those things that if it’s not in season, it’s just not going to be as good,” says Erwin. Enjoy the restaurant’s juicy peach cobbler and heirloom tomato salad this summer—those items will be gone come fall. And that emotional commitment—for which she credits her green thumb father—inspires her to go beyond simply sourcing responsibly. Geechee Girl hosts an annual farmers' dinner and Erwin devotes time to working with inner-city youth, helping them learn how to garden, grow and cook with fresh produce.